Tao or Dao (道, Pinyin: Dào, Cantonese: Dou) is a Chinese character often translated as ‘Way’ or 'Path'. Though often seen as a linguistic monad (especially by Westerners), the character dao was often modified by other nouns, each of which represented a subset of the terms multifarious meanings. Three such compounds gained special currency in classical Chinese philosophy: 天道 Tian dao (sky or natural dao—usually translated religiously as "heaven's Dao") 大道 Da Dao (Great dao—the actual course of all history—everything that has happened or will happen) and 人道 Ren dao (human dao, the normative orders constructed by human (social) practices). The natural dao corresponds roughly to the order expressed in the totality of natural (physical) laws. The relationship between these three was one of the central subjects of the discourses of Laozi, Zhuangzi, and many other Chinese philosophers. From the earliest recorded religio-philosophical texts onward, Tian Dao is explained using the concepts of yin and yang. The resulting cosmology became a distinctive feature of Chinese philosophy, one which was particularly expounded upon by members of the Daoist school. The early thinkers, Laozi and Zhuangzi, expressed the view that human dao was embedded in natural dao. If human lives are lived in accord with the natural order of reality, then human beings can truly fulfill their innate potentialities. Though the concept of Dao is most often understood in light of its Daoist exponents, the term was actually an important element of Chinese religio-philosophical discourse since time immemorial. However, these thinkers almost exclusively utilized in the human context (ren dao 人道) rather than the cosmological notion that came to dominate later usage. The clearest example of this early understanding can be seen in the Analects of Confucius. Ranyou said, "It is not that I do not rejoice in the way (dao) of the Master, but that I do not have the strength to walk it." The Master said, "Those who do not have the strength for it collapse somewhere along the way. But with you, you have drawn your own line before you start" (6.12). Gongxi Hua said, "When Zilu asked the question, you observed that his father and elder brothers are still alive, but when Ranyou asked the same question, you told him to act on what he learns. I am confused—could you explain this to me?" The Master replied, "Ranyou is diffident, and so I urged him on. But Zilu has the energy of two, and so I sought to rein him in" (11.22). In this way, while the dao is interpreted as a single path (that one is either walking or has strayed from), it is still adapted to each individual's aptitudes. In this context, harmonious behavior results from the optimizing one's tendencies and attitudes through the emulation of classical models: a moral vision that is most clearly described in the Zhong Yong (Doctrine of the Mean). A. C. Graham's Disputers of the Tao elegantly summarizes the Confucian dao: "the Way is mentioned explicitly only as the proper course of human conduct and government. Indeed he think of it as itself widened by the broadening of human culture: 'Man is able to enlarge the Way [dao], it is not that the Way enlarges man' (15.29)." However, he also notes a single passage in the Analects that could presuppose a Daoist understanding of the cosmos (17.19), stating that it "implies a fundamental unity of Heaven and man. [As such,] it suggests that with the perfect ritualisation of life we would understand our place in community and cosmos without the need of words." This humanistic understanding was prevalent in the pre-Daoist period. This being said, the fact that most key terms (i.e., dao, de, tian, wu-wei) were shared throughout the religious and philosophical corpora meant that later developments and modifications had considerable significance, even outside their tradition of origin. For instance, Neo-Confucian thought expanded the classical understanding of dao by including Daoist-inspired cosmological notions (as discussed below). Unlike other early Chinese thinkers, the philosophers who came to be retroactively identified as Daoists stressed the self-ordering simplicity of the natural world as a logical corrective for the problems plaguing human life. This naturalistic connection was commented on at length by both Laozi and Zhuangzi, as well as later philosophers such as Liezi, Ge Hong and Wang Bi. The concept of Dao is based upon the understanding that the only constant in the universe is change (see I Jing, the "Book of Changes") and that we must understand and attempt to harmonize ourselves with this change. Change is characterized as a constant progression from non-being into being, potential into actual, yin into yang, female into male. This understanding is first suggested in the Yi Jing, which states that "one (phase of) Yin, one (phase of) Yang, is what is called the Dao." 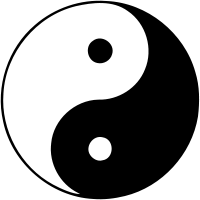 Being thus placed at the conjunction of the alternation of yin and yang, the Dao can be understood as the continuity principle that underlies the constant evolution of the world. For this reason, the Dao is often symbolized by the Taijitu (yin-yang), which represents the yin (darkness) and yang (brightness) mutually generating and interpenetrating in an endless cycle. In this context, the Daoist school began to extrapolate upon the metaphysical nature of this universal force. Though its various exponents addressed discrete elements of the Dao, their common focus is what permitted later systematizers (such as Sima Qian) to group them into a single intellectual lineage. The Tao, if we then try to grasp it, can be described as the organic order underlying and structuring and pervading all existence. It is organic in that it is not willful, but it is also order because it changes in predictable rhythms and orderly patterns. If one is to approach it, reason and intellect have to be left behind. One can only intuit it when one has become as nameless and as free of conscious choices and evaluations as the Tao itself. The Tao cannot be described in ordinary language, since language by its very nature is part of teh realm of discrimination and knowledge that the Tao transcends. Language is a product of the world; the Tao is beyond it—however pervasive and omnipresent it may be. The Tao is transcendent yet immanent. It creates, structures, orders the whole universe, yet it is not a mere part of it. The Way has its reality and its signs but is without action or form. You can hand it down but you cannot receive it; you can get it but you cannot see it. It is its own source, its own root. Before Heaven and earth existed it was there, firm from ancient times. It gave spirituality to the spirits and to God; it gave birth to Heaven and to earth. It exists beyond the highest point, and yet you cannot call it lofty; it exists beneath the limit of the six directions, and yet you cannot call it deep. It was born before Heaven and earth, and yet you cannot say it has been there for long; it is earlier than the earliest time, and yet you cannot call it old (Zhuangzi ch. 6, BW 77). Given a cosmological schema centered on the Dao, it is unsurprising that this notion was also central to the Daoist understanding of human ethics. Specifically, this understanding emerged from the conception that the natural operations of the cosmos were perverted by the desires of human beings. Thus, "morality" (understood broadly) consisted of banishing these desires in favor of unimpeded naturalness in thought and action. This view was echoed by Zhuangzi, who argued that attempts to assign values and categories are fundamentally contrary to the natural functioning of the world. As such, he suggests that “because right and wrong [i.e. discursive judgment] appeared, the Way was injured” (Zhuangzi ch. 2, BW 37). As mentioned above, it should be noted that in Daoism the complementary part of "non-action" (wu-wei) is that nothing necessary is left undone ("wu bu wei"). Thus, Daoism should be viewed as advocating the harmonization of "passivity" and "activity/creativity" instead of just being passive. In other words through stillness and receptivity natural intuition guides us in knowing when to act and when not to act. Remembering the Great Way is a spiritual awareness of one’s deep connection with the entirety of creation. This involves the adoption of a mode of ‘non-action’ that is not inaction but rather a harmonization of one’s personal will – otherwise tending towards egotism – with the natural harmony and justice of Dao. In addition to the philosophical traditions described above, the ethics and metaphysics of Daoism also inspired religious practice. As Kohn notes, "crucial to the religious experience of Taoism, the Tao is always there yet has always to be attained, realized, perfected. It creates the world and remains in it as the seed of primordial harmony, original purity, selfless tranquility." As such, these notions proved to be instructive for both Chinese monasticism and religious devotion. The Tao can be pure or turbid, moving or tranquil. Heaven is moving, earth is tranquil. The male is moving, the female is tranquil. The myriad beings are being born. But the mind disturbs it. But desires meddle with it. And the mind will be calm. And the spirit will be pure. ↑ See Wenlin, 1997-2007 Wenlin Institute. Retrieved March 25, 2008. ↑ "Dao" at [zhongwen.com zhongwen.com], which lists the etymology as a combination of "movement" and "ahead." ↑ Ames and Rosemont, 45. ↑ A. C. Graham. Disputers of the Tao: Philosophical Argument in Ancient China. (La Salle, IL: Open Court, 1993), 18. ↑ See Wing-tsit Chan. A Source Book in Chinese Philosophy. (Princeton, NJ: Princeton University Press), 262-263 for a concise introduction to the Dao De Jing. ↑ Livia Kohn. The Taoist Experience: An Anthology. (Albany, NY: State University of New York Press, 1993), 11. ↑ See also Zhuangzi's discussion of wu-wei. ↑ Qingjing Jing, translated in Kohn, 26-27. ↑ Arthur F. Wright. Buddhism in Chinese History. (Stanford, CA: Stanford University Press, 1959), 36. ↑ See, for example, Fritjof Capra. The Tao of Physics: An Exploration of the Parallels between Modern Physics and Eastern Mysticism. (Boston: Shambhala, 2000). The Analects of Confucius, Translated and with an introduction by Roger T. Ames and Henry Rosemont, Jr. New York: Ballantine Books, 1998. ISBN 0345434072. Chang, Dr. Stephen T. The Great Tao. Tao Publishing, imprint of Tao Longevity LLC. 1985. ISBN 0942196015. Graham, A.C. Disputers of the Tao: Philosophical Argument in Ancient China. La Salle, IL: Open Court, 1993. ISBN 0812690877. Kohn, Livia. The Taoist Experience: An Anthology. Albany, NY: State University of New York Press, 1993. ISBN 0791415805. Lao Tsu/Tao Te Ching, Translated by Gia-Fu Feng & Jane English. New York: Vintage Books, 1972. ISBN 0679776192. Lao Tzu; Lau, D.C. (translator); Sarah Allan (editor). Tao Te Ching: Translation of the Ma Wang Tui Manuscripts. Everyman's Library, 1994. ISBN 0679433163. Lao Tzu; Chuang Tzu; Legge, James (translator), The Sacred Books of China: The Texts of Taoism. Dover Publications, Inc., 1962. Quong, Rose. Chinese Characters: Their Wit and Wisdom. With Illustrations by Dr. Kinn Wei Shaw. Ram Press, 1944. Wang, Robin. "Zhou Dunyi's Diagram of the Supreme Ultimate Explained (Taijitu shuo): A Construction of the Confucian Metaphysics." Journal of the History of Ideas 66 (3) (July 2005): 307–323. Wei Wu Wei, "Why Lazarus Laughed: The Essential Doctrine Zen-Advaita-Tantra". London: Routledge and Kegan Paul Ltd., 1960. ISBN 1591810116. Wright, Arthur F. Buddhism in Chinese History. Stanford, CA: Stanford University Press, 1959. ISBN 0804705488. All links retrieved November 14, 20173. Taoism Directory, directory of sites with content related to Taoism and Taoist issues. This page was last modified on 14 November 2017, at 19:18.